Thunderstorms popped up along the coast early this morning, and now some of the heavier rains have migrated inland. These pre-sunrise storms reflect what is likely to be a messy forecast for the next several days as a weak cold front pushes into the area, just beyond Houston offshore, and then likely moves backward through Houston. Add it all up, and there will be a healthy chance of storms over the next several days—along with a brief interregnum of drier and cooler air. Hopefully. This morning’s storms are likely a precursor for showers and thunderstorms moving along a front that, near sunrise, is approaching the Interstate 35 corridor in central Texas. This should lead to elevated rain chances this afternoon and evening across most of the metro area, with storms moving from northwest to southeast. In terms of accumulation, most areas will probably see 0.5 to 1.5 inches of rainfall between Wednesday and Thursday morning, which could cause some brief problems on roadways but should for the most part be manageable. Some drier air should work its way into Houston behind the front, especially for areas well to the west and north of downtown Houston. 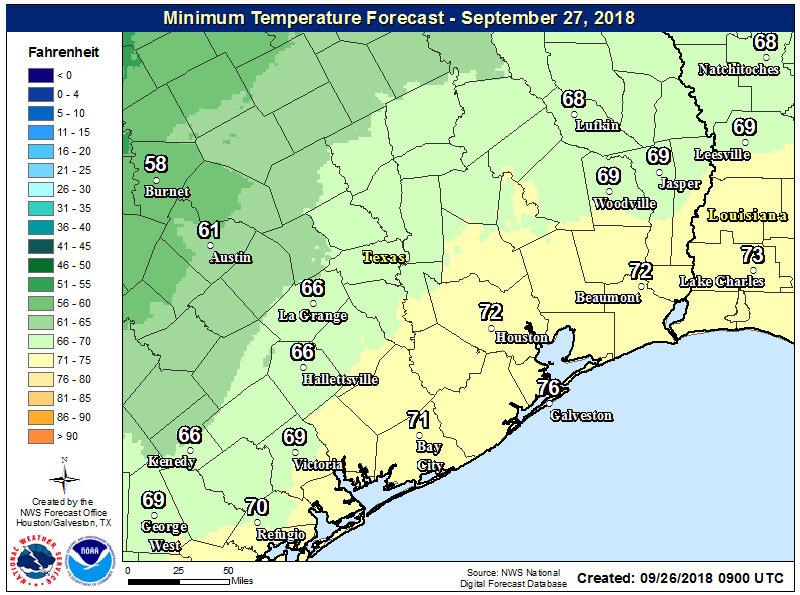 Lows in the 60s are possible for these areas, but unlikely within Harris County or the city of Houston itself. Any reprieve won’t last long, however, as the front should lift back onshore Thursday, likely leading to elevated rain chances during the afternoon or evening hours. (We do not expect these storms to be as heavy as those on Wednesday). Daytime highs on Thursday should be in the low- to mid-80s, and we sincerely hope everyone enjoys their 12 hours of almost fall-like weather. Not that we’re bitter about the lack of a strong fall cold front, or anything. 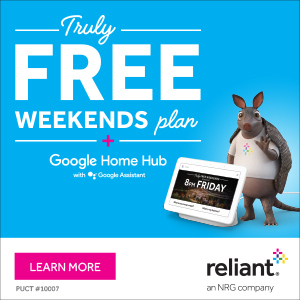 The forecast for the weekend is somewhere in the neighborhood of “who the heck knows.” Certainly there are plenty of ingredients for rainfall, with fairly high (although not excessive) moisture levels in the atmosphere and some upper-level disturbances. I wouldn’t be surprised to see most areas pick up another half an inch of rain, with locally higher levels, from Friday through Sunday. Saturday seems like the day with the highest rain chances, but do I feel comfortable with that forecast? Not really. High temperatures will be relatively cool, in the mid-80s, and you can count on mostly cloudy skies with lots of humidity. Next week looks drier in the sense that the threat of widespread rain appears likely to die down. Our first real cold front of the season still seems to be about 10 days away, in the Oct. 5 time frame. The models are still hinting at this time frame, and really we’d be a couple of weeks overdue by that point. So we’re watching and hoping for that. As I’ve previously noted, the Texas hurricane season appears to be pretty much over. 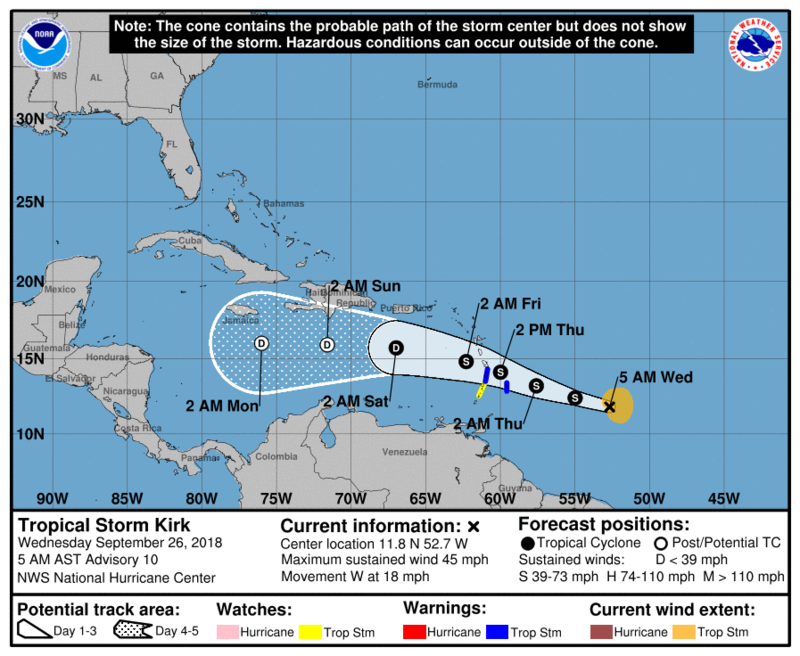 However, we’ve had several questions about the recently re-formed Tropical Storm Kirk, which will move into the Caribbean Sea this week. Here’s our forecast: Kirk will neither live long, nor prosper. Honestly, it seems like we’ve been getting these questions for generations, and they’re really our nemesis. It’s really pushing us to the final frontier, beyond it even, and about to send us into darkness. Ok, I think that’s enough Star Trek movie puns for now. We’d hate to incur the wrath of critics. (Also, don’t worry about Kirk for a second). Thank you for delivering my first contact with laughter this morning! Hahaha! I loved the Trek references. Dammit Eric! You’re a meteorologist, not a comedian. Apparently, that’s not entirely true! Hilarious! Glad we won’t be having any more trouble with tropics. Coming down strong here at 529 & BW8, sounds incredible in our large metal warehouse…. Come for the weather info, stay for the Star Trek puns. Jeez, we love you guys! Solid data, no hyperbole, and a side dish of humor! Thank you! You will have to excuse those of us asking about the tropics repeatedly…We had 13 ft of water and are still rebuilding. We want to be done with both the tropics as well as the hard labor and the thought of a storm jeopardizing it, well, we won’t go there…. Space City Weather commentaries are the only thing keeping some of us sane! This Kirk is a Red shirt…. so with all the puns, any friends of desoto here? Oh my goodness, you’re in rare form this morning, Eric lol. Personally, as long as I’m not underwater, my glass will always be half full! Good morning to you and I hope Matt’s transition into fatherhood is going well! This is what happens when thunderstorms wake me up at 4:30 in the morning, and i’m WIDE awake when it’s time to write the weather post. I’m impressed that you could be so funny so early in the morning! Star Trek puns, no worries with the Tropics, and using the word “interregnum” in a weather forecast! That’s Space City Weather, helping Houston get up on the right side of the bed even when it’s raining. Thanks Eric and Matt! Thanks for the enterprising commentary on Kirk! So, you’re saying Kirk will be no tribble at all? The first email I open every morning. Thanks for giving me a laugh this morning. I do like those temps where the first digit is a “6”! And “interregnum?” You’re getting too fancy for us, Eric. 🙂 On the subject, “We’d hate to incur the wrath of critics.” Just hope we don’t incur “The Wrath of Kahn” 🙂 That might be a really, really late season “tropical storm” hitting Texas. Sorry, couldn’t resist! Ummm, we’re past the “K” storms this year! Well the National Hurricane Center giveth and the National Hurricane Center taketh away, as we’ve seen many times with storms forming, appearing to die, then springing to life again like vampires. Maybe they come up a “K Prime” (as in repetitive algebraic symbols using the same letter). Then again, I don’t want that!